Global business leaders and investors are largely transfixed by two kinds of risk: macroeconomic and geopolitical. In the near term, this means a focus on the US Federal Reserve’s impending rate hikes and the upcoming elections in France and Germany. Over the longer term, it means awareness of structural risks like high sovereign debt, demographic shifts, and natural-resource scarcity. But there is a third, arguably more pernicious, risk lurking below most decision-makers’ radar: infectious diseases. According to the former director of the US Centers for Disease Control and Prevention, Tom Frieden, the world is at greater risk than ever from global health threats. People travel farther and more often. Supply chains, including for food and medicines, extend across the world. A poorly treated case of, say, tuberculosis (TB) in Asia or Africa can present in a hospital in the United States within days. Against this background, scientists are concerned about the recent uptick in epidemics of diseases such as Zika, Ebola, and avian flu. And they are alarmed by the resurgence of life-threatening diseases such as influenza, HIV, malaria, and TB. To be sure, in terms of fatalities, recent disease outbreaks and pandemics are a far cry from past global flu epidemics. Whereas the 2003 SARS epidemic resulted in 774 deaths , and the Ebola outbreak of 2014-2015 left 11,310 dead , the 1918-1920 flu epidemic claimed the lives of 100 million people – more than five times the number killed in the world war that had just ended. Indeed, some 5% of the world’s population perished. 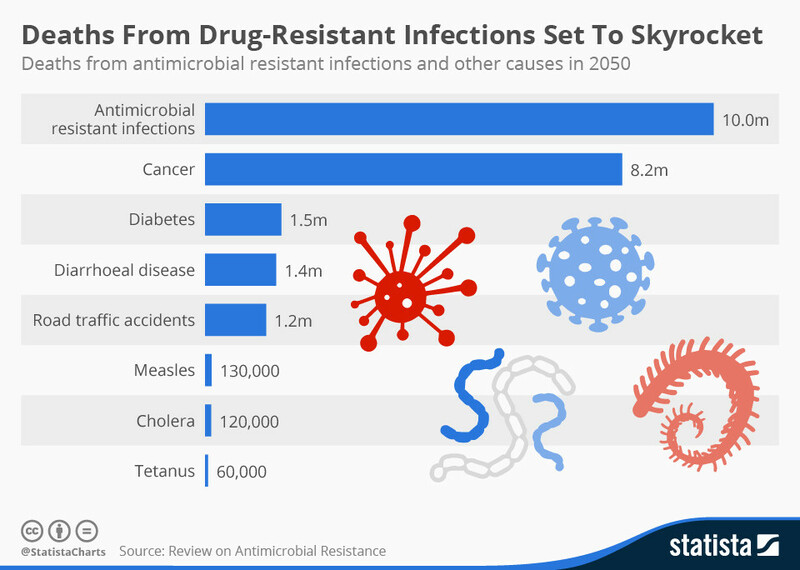 But the risks from infectious diseases that we face today could intensify substantially, owing to the rise of anti-microbial resistance (AMR). According to the World Health Organization , “480,000 people develop multi-drug resistant TB each year, and drug resistance is starting to complicate the fight against HIV and malaria, as well.” Antibiotic resistance, the WHO cautions, is now present in every country, putting patients at risk of worse clinical outcomes and at greater risk of death, while increasing the burden on health systems. England’s chief medical officer, Sally Davies, has warned that, if left unchecked, the growing impotence of drugs could be catastrophic. By 2050, she estimates, drug-resistant infections could be killing someone “every three seconds.” The Review on AMR estimates that, at that point, some ten million lives could be lost each year, at a cumulative cost to global economic output of $100 trillion. To put that into perspective, world GDP today totals $74 trillion per year. Yet the potential long-term human and economic consequences of AMR of are not widely appreciated by the public and, in particular, by financial markets. In fact, protection from public health threats is one vital area where markets do not deliver efficiently. As a result, it is governments that usually bear the costs of prevention and treatment. With government budgets already overstretched, coping with the intensifying health burden from AMR will be difficult, to say the least. Yet governments are unlikely to move fast to mitigate this risk. On the contrary, experience indicates that governments often struggle to align public spending with underlying or mounting problems, such as public-health threats, until they reach a crisis point. More people died of cancer in the US last year than in combat. In fact, last year’s 580,000 cancer deaths exceed the roughly 430,000 battle deaths, on average, in World War I, World War II, the Korean War, the Vietnam War, and the Gulf War. Yet government spending on cancer averages approximately $4 billion per year. That is just over 0.5% of the annual military budget of roughly $718 billion. Of course, government budget-allocation decisions are complicated and dogged by political imperatives. The US military employs some three million people, making it the single largest employer in the world, and there is substantial political pressure from some constituencies to place the highest priority on America’s military dominance. But it is not just a matter of how much is spent; it is also a matter of when. Governments don’t wait for war to break out before investing in the military. Yet they do tend to wait for crises to erupt before they invest in fighting infectious diseases. The world spent $15 billion on its emergency response to the SARS epidemic and $40 billion on its response to Ebola. In 1918, the crisis response to the flu pandemic cost some $17.5 trillion. Had countries spent more on mitigating the risk of such disease outbreaks – for example, by fortifying their health-care systems and promoting responsible use of antibiotics – those huge emergency payouts may not have been necessary. At the very least, they probably would have been smaller. In this sense, the fight against infectious diseases closely resembles the fight against climate change. Though the threat is substantial, it is not immediate, so governments continue to pursue other priorities, allowing the threat to grow, largely out of sight. As a result, it is not adequately priced into the markets. When the crisis finally erupts, the true scale of the threat will become clear. But by that point, it will be much more difficult and expensive to contain, resulting in far more casualties. Unfortunately, that point may be closer than anyone – government or investor – expects.